There are no nuts in Nut Brown Ale, let’s get that settled right away. Toasted nuts are of course a big source of umami. The nutty flavor in Nut Brown Ale, however, comes from specialty malts including British Brown and Special B that are an integral part of its recipe. I first brewed this beer on March 20, 1999 and called it Equinox NBA. The idea was to create a home brew that I could take to the “Backcountry Weekend” at Henry Coe State Park, where I was a volunteer docent. We would set up camp at the back country staging area, help the visitors, and then enjoy some grub and homebrew and play for the visitors around the campfire that night. My esteemed band mate at the time Dave Perrin declared it “extraordinary” and so I decided to brew it again. My updated recipe is brown the way that mahogany is brown, with deep red highlights. It’s as nutty as a jaybird hoarding umami booty. Where the original recipe used corn sugar to boost the starting gravity to 1.050 (12.5 Plato) this one relies on the umami-boosting traits of Lyle’s Golden Syrup, Taikoo golden unrefined sugar from Mauritius and some hand-picked dark Belgian candi sugar crystals. A touch of sea salt and gypsum rounds out the character. This version was bittered with Challenger hops and flavored with Goldings. I added aroma with some home grown “Feral Fuggle“ I’d gathered from the local hop vines. Brewed with White Labs’ WLP 004 Irish Ale yeast this version picked up a silver medal at the Toronto Anything Goes competition. 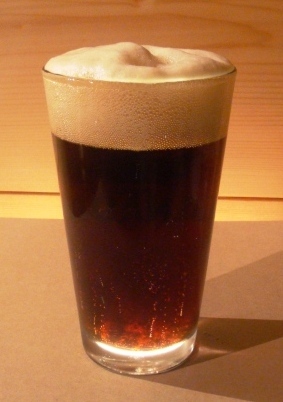 This entry was posted in Uncategorized and tagged dave perrin, henry coe state park, irish ale yeast, nut brown ale.